One week ago today, I underwent two surgeries. The first was planned. The second was not. I am now sitting at home, listening to my daughter play in her room and feeling very grateful to be alive. My recovery will take longer than planned — losing 2 liters of blood will do that to you — but, in the end, everything should return to normal. One of the things that will hopefully return to normal more quickly is writing reviews. I am scheduled to run a review of The Transparency Tonic today as part of the official blog tour. I had planned on getting it written shortly after my initial surgery, but, well, (see above). 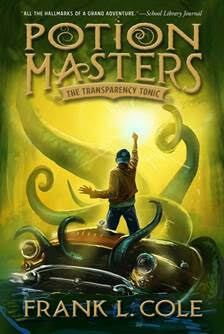 The Transparency Tonic is the second book in Frank L. Cole’s Potion Masters series. The series follows Gordy Stitser, one of a select group of people who know about the secret society of potion masters. His mom happens to be on the Board of Ruling Elixirists Worldwide (B.R.E.W. ), and she’s been training Gordy since the moment he showed aptitude. The Transparency Tonic takes place nine months after the series’ first book, The Eternity Elixir. Nine months since Gordy and his friends, Max and Adilene, saved B.R.E.W., and the power source for the secret society of potion masters. Now, the friends are starting eighth grade, and everything is changing. Gordy has been moving forward with his potions training, but he’s been zoning out during practice, and he knows something is wrong. Meanwhile, in Greenland, Mezzarix (a dangerous potion maker and Gordy’s grandfather) has escaped his Forbidden Zone with the help of a mysterious woman who requires Mezzarix’s help in replicating an unusual solution known as Silt. It could be just the weapon Mezzarix needs to destroy B.R.E.W. forever. I wish I had the time to reread The Eternity Elixir prior to The Transparency Tonic. While Gordy and his friends were immediately familiar, I had forgotten some of the finer plot points that would have been helpful to the overall flow. While The Eternity Elixir feels more like an overall introduction to the potions world, The Transparency Tonic is more immersive. You definitely need to read the first book before reading the second. Cole’s writing is smooth and accessible, and his main characters are equally as likeable as before, although Gordy comes across as more genuine than Max and Adilene. The Potion Masters series is a great option for fans of Shadow Mountain’s Mysteries of the Cove and Fablehaven series.